THE SING OFF: Nick Lachey, No Judging in Future & Episode Spoiler! “The Sing-Off” host Nick Lachey talked during a phone conference call about judges, and his a cappella past. He enjoys hosting the show greatly, and says he’d never want to be a judge on the show. “I’ve had my own opinion that has been different from what the judges decided. As I’m waiting back stage then see who is sent home, I have the same reaction as people at home”. Lachey reacted, “Judging’s not my thing”. “The Sing Off” has expanded it’s groups competing this season from eight last season to sixteen. Lachey stated that the reason for this change is that the show got expanded to eleven episodes versus only five from last year. Because there are more groups competing, there is also more diversity in the styles of the groups. As a result, they’ve seen the first ever rapper on “The Sing Off” stage. “I couldn’t be happier with the level of talent and level of execution of groups this year” said Lachey. Lachey state that by being in the music business for as long as he has, it’s easy to get jaded. But, being around the groups on “The Sing Off” he said, “their passion is contagious”, and “It’s refreshing to be around people who have the excitement and passion. It’s neat to see the family bond that they share together”. 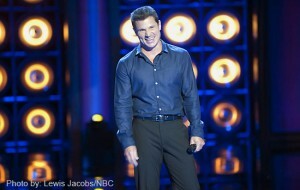 "The Sing Off" host Nick Lachey. But, “the competition is stiff and can’t imagine the pressure the groups are under, said Lachey. Reaching boy-band success with the group 98 Degrees, Lachey said that his roots are in a cappella. He used to perform a cappella in a babershop quartet. When 98 Degrees formed, they went around doing a cappella to whomever would listen. He credits a cappella for “the thing that created opprotunity” and inspired the band to form. It’s the reason Motown Records signed the boy band he said. “On every album, we always did one a cappella song. We always wanted to continue that foundation”. The reason why a cappella is so popular right now? Lachey says it’s because “people understand and appreciate watching real talent”, and “with a cappella there’s no where to hide so you get the real performance”. In an era of auto-tuning and special effects, he thinks audiences appreciate the raw talent that a cappella provides. Plus, with “a cappella we’ve gotten past the stereotype of just being du op or barber shop. It takes talent to pull it off,” Lachey pointed-out. In upcoming episodes, viewer can expect to see the first-ever country and western episode, and first ever hip-hop episode. Lachey’s advice for doing a cappella well is, “It’s really about practice. The blend is so important. You can tell the groups that perform a long time together because when done well, it’s one voice. SNEAK-PEEK TO NEXT WEEK’S EPISODE: SPOILER ALERT! In next week’s episode of “The Sing Off” viewers will see how great the “Dartmouth Aires” really are when they perform “Pinball Wizard” by The Who. Lead vocalist, Michael get called a “rock star”. Dartmouth Aires made a pinball out of one of their singers during this unforgettable performance. Each group performs two arrangements per show. Upcoming performances to look forward to include: “North Shore” performing “Unchained Melody” by the Righteous Brothers, then “The Lazy Song” by Bruno Mars with a doo-wop twist. Audiences also saw a group give a not so great performance of The Jackson Five’s “One More Chance”. Dartmouth Aires made a pinball out of one of their singers during their unforgettable performance of “Pinball Wizard” by The Who! In next week’s episode, the NBC promo shows judge Shawn Stockman getting emotional. We’re not sure if this promo could be showing the moment that we were on set. During that time, Stockman got very emotional when an eliminated group performed either the song “It’s So Hard to Say Goodbye to Yesterday” or “End of the Road” both songs very near and dear to Stockman which are his group’s “Boyz II Men” songs. While on-set, he stated that the song was special to him because it was produced by his mentor. Update: This was not aired on television. The song was “It’s So Hard to Say Goodbye to Yesterday” by “Sonos”. Also on this season of “The Sing Off” although it’s not yet been revealed yet, viewers can expect to see upcoming battle rounds where the bottom two groups will face-off for a second chance to keep their spot on “The Sing Off” in hopes of winning the $200,000 recording contract as the show’s grand prize! So far, the judges have been exiting groups after eliminations. But, I have a feeling some of these groups might be returning. Not sure if that’s the plan, but we’ll be watching! “The Sing Off” airs on NBC Mondays at 8/7c.